Rumoured to be happening and now it appears some-one at M$ jumped the gun (again) and made the xbox.com webpage for the new reward service live. Microsoft's "Xbox Live Rewards" program, which began testing over a year ago, looks set to finally be about to open to the public, with a page turning up on Xbox.com devoted to the service. 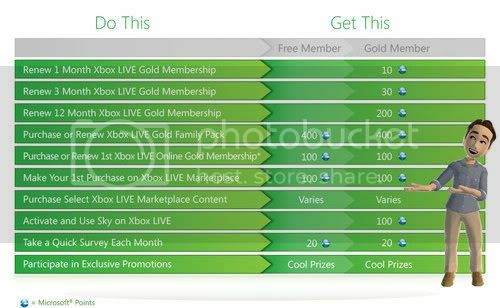 The program essentially rewards users for spending money on Xbox Live, giving out Microsoft Points and other freebies for doing things like renewing Xbox Live subscriptions and purchasing content on the various Xbox Live Marketplaces. You can see an example chart below; we don't know much more specific stuff, because while this welcome page is active, any attempts to login and access further content or information are met with dead links. It seems the website is live and you can now register to be part of the program. Rewarding people for spending money, they don't give stuff for free! I spend an obscene amount of MS Points. I am excited! The site still doesn't seem to be fully functioning. Why can't I access my account information immediately after Registration? A. It takes up to 36 hours to verify your information and set up your account. Don't worry, once you sign up we'll begin tracking your activity so you can earn Rewards points. It's been more than 36 hours and I haven't received an update on my account. Is there a problem? A. While most users receive confirmation within 36 hours, in rare circumstances, it may take up to 96 hours for your account set up to complete. You will receive an email once your information is verified. Thanks Zero...I had the same email as Neato but no activity on the site yet. Spose quite a few users will have signed up for this in the last 24 hours. I'm most interested in how they deal with back-dating rewards? I doubt they'll award any but I can hope. This is Microsoft we're talking about, they won't back date it and this current system will work ok for a while before everybody starts hating it and then they'll make us sign up again with a brand new flashy rewards system, you know just like they do with Windows all the damn time! To go https://microsoft.promo.eprize.com/holiday/ and play once per day until December 31st. US & UK only.